Guadalupe is White Shark Heaven!!! Guadalupe bound…We left port, thankfully with a good crossing. Something, I was extremely happy about. My last major crossing had us in 15 foot seas. The ocean was screaming at us and it felt like we would never see land again. Nothing worse than being locked down in your bunk for 20 hours straight, not moving because you just felt like crap. The good and bad thing was I found out what my super power would be if I had one; Projectile vomiting. Disgustingly, I was amazing at it! Thankfully this wasn't a crossing like that…Nope this was a heavenly crossing. We made good time and all of us were anxious to arrive. I was excited to see what the next few days of diving with white sharks would be like. 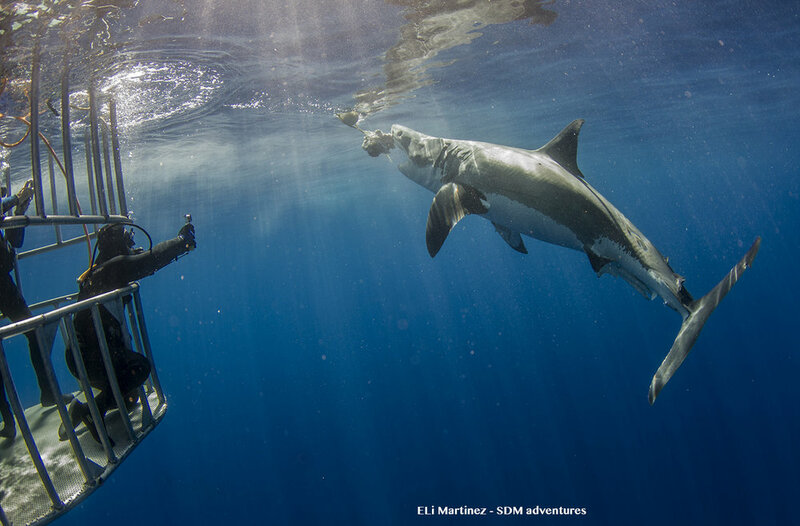 Our trip last year was good, but the whites were in and out, with a lot of down time in between visiting sharks. I was really hoping this years action would be better….and it was! We dropped our anchor into flat calm seas. As I looked around the first thing I noticed was that there were no clouds. There are normally clouds rolling off the top of the volcanic mountains here, but today there wasn’t. The skies were clear, the sun was out and the visibility looked amazing. Within an hour of arriving, our first shark show up and the mad dash for gear began. Shortly after that a second shark, then a third. Once we started diving, it just never stopped. From about 9 in the morning till the last divers entered the cages in the evening - the sharks never stopped rolling in. September is such a great time to be here, because its the middle of the season. It’s good for both small sharks and the big boys. And on this trip, we had them all…from small, 10 foot sharks, to 17 foot, 3,000 lb. monsters. It was a dream. The stress of running a shark diving trip is that you are always worrying that no sharks will show up. The smiling faces and full camera cards told me that this was not going to be one of those trips. The white sharks performed like rock stars. 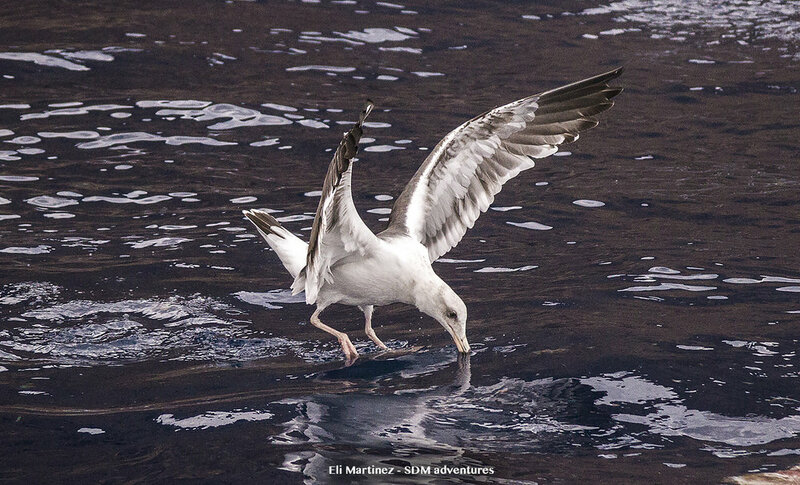 They cruised by our cages, over and over again, trying hard to take the hang baits off our shark wranglers. The sharks are getting smarter, you could see them trying to figure things out. They kept changing their approach strategies, using speed and stealth to steal the bait away. It was awesome. We had quite a few half breaches as the sharks would rocket up from underneath the cages to surprise our wranglers. Everyone got a show - Those that were in the cage and our guests that were topside. We all had a blast watching the cat and mouse game that was going on. By the end of the day, everyone was exhausted and cold from hours spent in the cages. It is hard sometimes to explain to people who are there for the first time just how special a day like this is, because these kind of days are so rare. I was just thankful it happened on my watch. Of course in the morning when we kicked off our 2nd day, I was half expecting it to be back to old Guadalupe, where the sharks come in, hang around for 10-30 minutes and then take off. But nope, when the cages were dropped (at 8am), within 20 minutes our first shark showed…and again, it was going off! The rest of the day played out like a repeat of day one. The only difference was we lowered one of the cages to 30 feet, to get a different perspective of the sharks. Those rides are always so much fun. The day was just amazing, the sharks never stopped coming in. I shot over a thousand photos in a two hour session. Most ended up crap, but what was great was getting the opportunity to shoot that much. I got out of the water cold and happy, excited to see what day three would bring…BUT, our captain dropped a bomb on us. Tropical storm Frank was headed our way. So, we finished up our day of diving, pulled the cages and headed home. We had one more day of diving left and even though everyone was not thrilled with leaving, riding home for 18 hours through a tropical storm was not something anyone wanted to do either. So we left and thankfully everyone was very happy. The two days in the water were so great no one really felt let down. I was excited for everyone and yes I admit, secretly even more excited about beating the storm for a smooth crossing home. Which meant, that my super hero, secret identity was not revealed on this trip. Till next season Guadalupe…You were amazing. A video from our trip by one of our guests Steve Crawford. So much fun. Newer PostShark Diving can contribute to Shark Science! Older PostOur new website...Hell Yea!